There is simply no downside to voting for Sanders during this month's final Democratic primaries. Bernie may still be our next President, despite the widely parroted insistence by a Clinton-biased corporate media and Democratic Party insiders' that Bernie is finished. These are the same voices that have been singing the "may as well stay home Bernie voter" song since the very beginning of the primary season. There will be time to vote against Donald Trump in November. 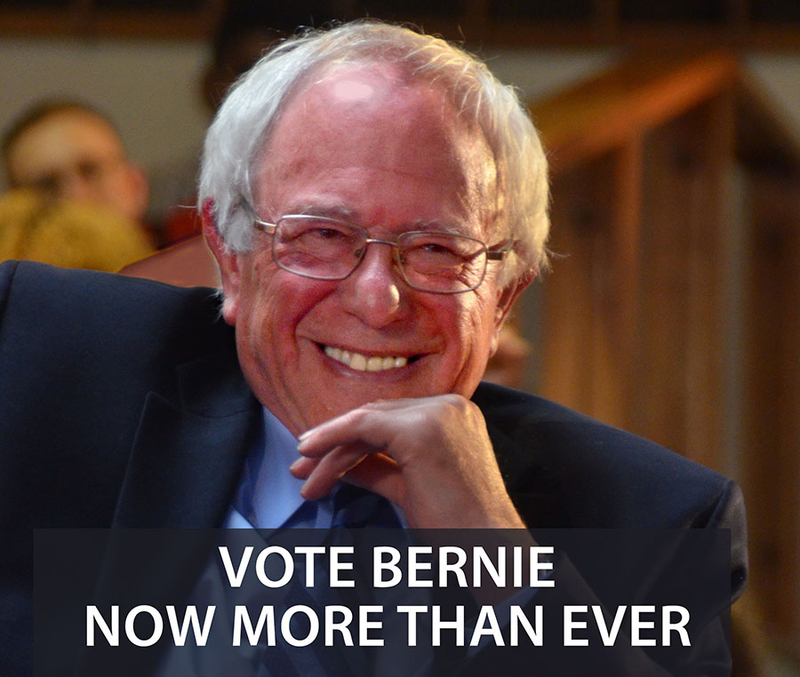 This is the time to vote FOR Sanders. Because of his huge national support among young and independent voters (two groups whose turnout is needed to win a presidential election), every poll shows Bernie easily beating Trump in November. Recent polls show that Bernie, unlike Hillary, will beat Trump in every swing state, and that his overall projected margins of victory are more than double Hillary's. Clinton is projected to lose to Trump in several key swing states, and some also show her losing the entire election. Bernie wins by double digits. The superdelegate system has felt like a rigged Democratic National Committee coronation process for Hillary Clinton, tipping the scales with about 500 extra delegate votes well before the first actual citizen expressed her preference at the polls. It is impossible to say how many voters were swayed away from Sanders because of Clinton's constantly repeated superdelegate-enforced "inevitability," or whether a level playing field would have resulted in Sanders being the front runner right now. Democratic superdelegates are loyal--but they are not stupid, and they do not want to lose the White House. Bernie Sanders' call for their support on July 25 is not pie in the sky. It is reality politics. 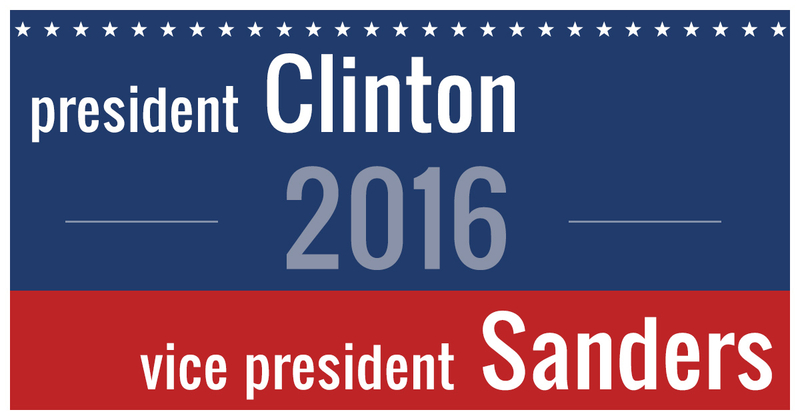 And victories by Sanders during the final June primaries will serve to make this possibility much more likely. That's why California's June 7 election has shaped up to be the most important Democratic contest of the primary season. And why it is more important to vote for Bernie this month than ever. Bernie, not Hillary, is the one packing stadiums with newly motivated young voters and previously apathetic citizens of all races. Bernie's momentum continues to soar, just as Clinton's popularity, hammered by the latest report on her email scandal and a merciless Trump campaign, continues to decline. If Sanders pulls off an upset victory in California, which feels likely, and in other states during the next few weeks, then Bernie's purportedly impossible dream may yet become our reality. Winning California will not give either Sanders or Clinton the delegates they need to clinch the nomination. And there is a low likelihood that Sanders will win the two thirds of all remaining unpledged primary delegates (908) needed to overcome Clinton's current 268 delegate advantage. But he can come to within 5% or so of her pledged delegate count. And the superdelegates might do the rest. This will have nothing to do with how Clinton feels about Bernie Sanders. It will have everything to do with the only action that can turn out a sufficient number of Bernie's anti-establishment supporters to win the November election against Trump. This, or selecting as VP Elizabeth Warren (whose Senate seat is probably too valuable for the Democratic Party to lose right now), would be the only way to overcome the distrust that the fast-growing progressive wing of the Democratic Party has for Hillary Clinton. Short of a Sanders nomination, it would be the only way that millions of Sanders voters will feel represented by a Clinton-headed Democratic Party, and the only way they will feel that the Sanders revolution is at least on deck to have a positive impact on our collective future. (Here's our new petition urging her to do this). The year 2016 will go down in history as the year of the anti-establishment election for both major political parties. This recent video interview of an African American Sanders supporter articulates the worldview of an anti-establishment Sanders voter who says that nothing short of a Sanders or Elizabeth Warren vice presidential selection will compel him to vote for Hillary Clinton. More than half of the Bernie supporters I have interviewed say this. Millions of voters probably feel this way--enough to sway the November election. 3)	Compel Clinton to name Sanders as her running mate. Many wonder why Sanders supporters are so reticent to support Hillary Clinton, to "unite" the Democratic Party based on our shared beliefs. A lot of this has to do with the fact that we believe that Bernie, not Hillary, is candidate who better represents these viewpoints. A carefully orchestrated corporate media-supported campaign of misrepresentation has hidden from most citizens the facts that on the voter-critical issues of public campaign financing, Medicare for all, labeling genetically modified food, and the full federal decriminalization of marijuana, it is Sanders, not Clinton, who represents the views of about 80% of Democratic voters--and a majority of Americans as well. Looming even larger in the minds of Bernie voters is the issue of war and peace. Many of us find it it impossible to support Hillary Clinton's endless war doctrine. That she continues to praise Henry Kissinger, the notorious "butcher of Cambodia," for his "realism" based brand of foreign policy, sends alarm bells ringing. As recently reported, a people-powered media revolution fuels the Sanders campaign's success, defying carefully messaged deception on Hillary Clinton's behalf. Experience? Bernie has 34 years holding government office compared to Hillary's 12 years. Effectiveness? Bernie's 83% approval rating by the voters of Vermont is the highest of anyone in the Senate: it was about 50% higher than Clinton's was when she was New York Senator. But we've got to elect him first!